Bud Budweiser Alum. MLB Major League Baseball. MORE GREAT SPORTS BEER SODA BOCK COLLECTIBLE STUFF. EMPTY never filled factory bottle ~ RE-CAPPED with nice matching newer 'red-bud-crown'-cap ~ ALL ORIGINAL BOTTLE. Budweiser BUD LIGHT Alum. NO born-on-date factory bottle #501242. MORE GREAT SPORTS BEER SODA BOCK COLLECTIBLE STUFF. MLB Major League Baseball. REDEMPTION BOTTLE. 1 EMPTY Beautiful PINT 16oz LONG neck aluminum bottle-can 2008. (A) ANGELS OF ANAHEIM 2007. Special Bottle made for the 2007 Pro Baseball Season. MORE GREAT SPORTS BEER SODA BOCK COLLECTIBLE STUFF. no born-on-date - never filled factory bottle EMPTY ~ RE-CAPPED ~ ALL ORIGINAL DISPLAY BOTTLE CAPPED WITH NEWER MATCHING EXCELLENT CROWN-CAP. MONSTERS of the MIDWAY. 1 empty pint Beautiful LIMITED EDITION all aluminum bottle-can with screw top crown (2010). Features Team colored accents on neck and Bears' logo. MORE GREAT SPORTS BEER SODA BOCK COLLECTIBLE STUFF. THIS BOTTLE IS EMPTY WITH CAP. YOU ARE BUYING 1 EACH EMPTY BOTTLE. NEW STYLE ALUMINUM BOTTLES WILL HAVE SMALL IMPERFECTIONS SUCH AS SCRATCHES, DIMPLES, RUB SPOTS OR OTHER MANUFACTURER HANDLING MARKS BUT STILL DISPLAY NICELY. Featuring Chief Wahoo! Budweiser Alum. Cleveland Indians. MORE GREAT SPORTS BEER SODA BOCK COLLECTIBLE STUFF. MLB Major League Baseball. 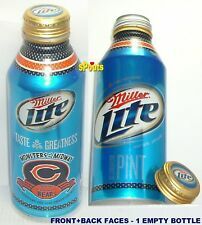 1 EMPTY Beautiful 16oz LONG NECK PINT aluminum bottle (2007). Bud Budweiser Alum. SHEA STADIUM. MORE GREAT SPORTS BEER SODA BOCK COLLECTIBLE STUFF. MLB Major League Baseball. 1 EMPTY Beautiful 16oz LONG neck aluminum bottle pry-off crown-cap (2008). great condition BUT HAS A COUPLE SHALLOW DENTS couple scratches, no sun-fade, no rust, no holes . BOSTON CELTICS. 1 EMPTY Beautiful 16oz LONG neck aluminum bottle (2008). N B A National Basketball Association. EMPTY ~ RE-CAPPED ~ ALL ORIGINAL BOTTLE with correct nice crown-cap. DENTED condition (along the bottom shoulder) and has a few scuffs. Budweiser Alum. Brewed and Canned by Anheuser-Busch, Inc. No born-on date, NEVER FILLED - Factory prototype. EMPTY ~ RE-CAPPED ~ ALL ORIGINAL DISPLAY BOTTLE WITH NEWER CAP/CROWN (bottle cap is excellent). Budweiser Alum. Los Angeles Lakers. OFFICIAL SPONSOR. MORE GREAT SPORTS BEER SODA BOCK COLLECTIBLE STUFF. NATIONAL BASKETBALL ASSOCIATION. EMPTY ~ RE-CAPPED (NEWER EXCELLENT Bud 'CROWN' bottle cap) ~ ALL ORIGINAL DISPLAY BOTTLE. Bud Light -Budweiser Alum. SHEA STADIUM. great condition BUT HAVE A COUPLE SHALLOW DENTS FEW SCRATCHES, no sun-fade, no rust, no holes . Display great-. MORE GREAT SPORTS BEER SODA BOCK COLLECTIBLE STUFF. COLUMBUS BLUE JACKETS. National Hockey League NHL TEAM SPIRIT. 1 EMPTYBeautiful ALL ALUMINUM screw top cap crown PINT 16oz. half quart tin beer bottle-can. MORE GREAT SPORTS BEER SODA BOCK COLLECTIBLE STUFF. 2019 limited edition event souvenir. (USA National Parks Celebration). 1 EMPTY Beautiful 16oz PINT LONG neck aluminum bottle 2019. Budweiser Alum. ALL ORIGINAL BOTTLE and ORIGINAL CROWN-CAP. Bottle is in excellent condition BUT has a few small shallow dings, couple minor scuffs. San Antonio SPURS. Budweiser Bud Light Alum. BUD ( LIGHT. Brewed and Canned by Anheuser-Busch, Inc. No born-on date, NEVER FILLED - Factory prototype. EMPTY ~ RE-CAPPED ~ ALL ORIGINAL DISPLAY BOTTLE WITH NEWER CAP/CROWN (bottle cap is excellent). ). 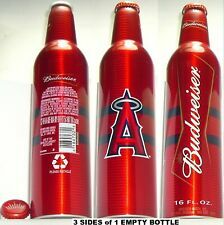 EMPTY St. Patty’s Day Budweiser 503486 Non-Redemption Bottle, Bud Light 503417 is a Redemption bottle. These are pry tops, and bud still isn’t putting devisers in the box. All bottle have some small imperfection, not even the set I’m keeping are perfect. BEST BOTTLES GO FIRST, price will drop with increased imperfections. IF YOU WANT PERFECT BOTTLES, YOU CAN TRY AMD FIND A CASE OF EACH, AND THEN HOPE. 1 EMPTY Beautiful 16oz LONG neck aluminum bottle (2013). N B A National Basketball Association. ~MIAMI HEAT ~. EMPTY (Re-Capped with correct crown-cap). Bottle is ALL ORIGINAL in excellent condition BUT has a few minor scratches, couple very minor dings, no fade, no holes, no rust, no major dents. LAND OF THE FREE BECAUSE OF THE BRAVE. ONE EMPTY Beautiful aluminum beer bottle-can 16oz pint twist-off crown design. MORE GREAT SPORTS BEER SODA BOCK COLLECTIBLE STUFF. ALL ORIGINAL BOTTLE WITH ORIGINAL CROWN-CAP. JUNE 15-18, 2017. 2017 ALUM. BOTTLE use-by-dated 03AUG17 (date may vary) REDEMPTION BOTTLE. 2017 LIMITED EDITION. 1Beautiful, all original 16oz LONG neck modern with twist-off crown-cap aluminum bottle (2017). OZ OF HEINEKEN 2018 RARE LIMITED EDITION ALUMINUM BOTTLE #07160139~. 100% AUTHENTIC 2018 RARE LIMITED EDITION HEINEKEN~. BOTTLE IS BOTTOM DRILLED, EMPTIED. CAREFULLY DRAINED, TWICE~. VERY COOL~! BOUGHT NEW, DRILLED, DRAINED, LIKE NEW FOR THE COLLECTORS~. THIS IS AN EMPTY BOTTLE WITH THE CAP SET BACK ON. Has original unique gold Tsingtao bottle cap-crown. 2019 SPECIAL EDITION. 1 EMPTY Beautiful 355 ml ('12 ounce' SIZE) long-neck aluminum beer bottle-can 2010's DATED 12-28-18 (for sale in 2019). Pig Pig Pig Pig Pig Pig. 1 Beautiful, all original 16oz LONG neck aluminum bottle SCREW-TOP CAP 2018. Bud Light Alum. EMPTY ~ ALL ORIGINAL DISPLAY BOTTLE with original twist off crown cap. MORE GREAT SPORTS BEER SODA BOCK COLLECTIBLE STUFF. 1 EMPTY Beautiful 16oz long-neck aluminum beer bottle-can (with new pry-off crown-cap added) (from January 2016). (FEBRUARY 7, 2016). Bud Light Budweiser Alum. Bottle #502703. SUPER BOWL 50 CHAMPIONS. What we have here is a #42 Jackie Robinson BUDWEISER ALUMINIUM CAN EMPTY. Budweiser Alum. Bottle #50357495. 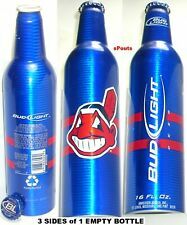 1 EMPTY Beautiful 473ml (PINT SIZE) long-neck aluminum beer bottle-can 2016 ish. CODED BORN ON DATE 2016. BEER / BIERE. EMPTY (RE-CAPPED). ALL ORIGINAL BOTTLE. Bottle is in excellent condition BUT has a few minor dings and scuffs, no major dents, no holes, no fade, no rust. He wore # 36 on his NFL football uniform, but if you notice his # on the can is 3/6! The Pittsburgh Brewing Co. Pitt., Pa. Pennsylvania 15201. MORE GREAT SPORTS BEER SODA BOCK COLLECTIBLE STUFF. 1 empty Beautiful 12oz. Produced for the 2007 Black Hills Sturgis Bike Rally South Dakota. Budweiser Alum. Bottle #500998. ~ Budweiser ~. RALLY AND RACES. 1 EMPTY Beautiful 16 oz long-neck aluminum beer bottle-can (2007 event). Carlsberg beer - a 330 ml empty aluminum beer bottle, Limited edition, Israel. Good condition, original cap in a very good condition with very minor dents. Budweiser BUD Alum. OFFICIAL BEER. MLB Major League Baseball. MORE GREAT SPORTS BEER SODA BOCK COLLECTIBLE STUFF. Kansas City Royals. 2012 #501906 01JUN12 born-on-date (date may vary or not dated factory bottle). In recognition of the CUYAHOGA VALLEY NATIONAL PARK. 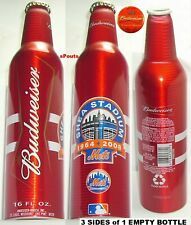 BUDWEISER aluminum twist-off bottle with cap 16 oz - empty. national beer can collectors CAN-vention is in Albuquerque this year. BCCA 25547. ~~Budweiser ~~. Budweiser Alum.Bottle #501209. 1EMPTY Beautiful 16oz PINT long-neck aluminum beer bottle-can (2008). MORE GREAT SPORTS BEER SODA BOCK COLLECTIBLE STUFF. All Original. RE-CAPPED WITH NEWER CROWN-CAP. He wore # 36 on his NFL football uniform, but if you notice his # on the can is 3/6! PITTSBURGH STEELERS. 1 EMPTY Beautiful 12oz. all aluminum wide-mouth stay-tab top tin beer can from 2005. The Pittsburgh Brewing Co.
(BALTIMORE RAVENS. Bud Light Budweiser Alum. Bottle #502025. 1 EMPTY Beautiful 16oz long-neck aluminum beer bottle-can (2013). National Football League NFL TEAM SPIRIT ALL ORIGINAL. EMPTY - RE-CAPPED WITH ORIGINAL BOTTLE CAP / CROWN). 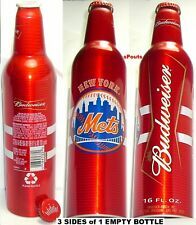 Budweiser BUD Alum. 1 EMPTY Beautiful PINT 16oz LONG neck aluminum bottle-can 2011. MLB Major League Baseball. MORE GREAT SPORTS BEER SODA BOCK COLLECTIBLE STUFF. Arizona Diamondbacks. REDEMPTION BOTTLE. 2017 NFL KICKOFF. PITTSBURGH STEELERS. Bud Light Budweiser Alum.Bottle #503055. 1 LIMITED EDITION EMPTY Beautiful 16oz pint modern aluminum beer bottle-can with twist-off re-closable crown-cap from the 2017-2018 NFL Pro Football Season. 2015 Convention -Milwaukee, Wisconsin. 1 EMPTY Beautiful not sized long-neck aluminum beer bottle-can (2015). September 3-5, 2015. LTD EDITION "Collector's Edition" WORLD CONVENTION. Listed as 'USED' because this bottle has a lot of minor 'factory' ripples.